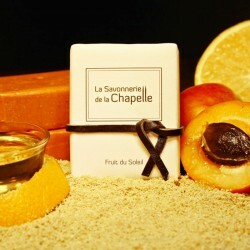 Soap "Fruit of the Sun"
Cold Soap "Fruit of the Sun", a natural soap, enriched with Apricot kernel oil and honey, and scented with essential oils of Mandarin Orange. Fruit of the sun, fruit of the summer, this soap has sweet and sweet scents which assure you a perfect relaxation while moisturizing and regenerating your skin. Unlike soap Marseille and Aleppo soap cold is not heated, it is carefully rested for 1 month and thus retains the properties and benefits of all its ingredients. Raising the temperature of the soap during its manufacture speeds up the saponification process to make it almost immediate, it is also what makes possible its industrialization but, in doing so, if the soap can retain its scents, its benefits are lost. Cold soap is without a doubt the most gentle and nourishing washing product for the skin. The cold saponification allows to integrate precious oils without denaturing them. By buying this product you can collect up to 6 loyalty points. Your cart will total 6 points that can be converted into a voucher of €0.48. Soap "Night of the East"